Our Nursery is for our infants who are not yet crawling. Our Nursery is designed to provide each child with a feeling of warmth, confidence, and security. Our schedule is flexible and based on each child’s needs. Our small and quaint environment allows a positive experience and warmth that is essential to a young infant’s growth and development. Our crawling and walking infants participate in activities that develop their growing minds and bodies. We work to develop a sense of trust and self importance in each child in a warm and nurturing environment. Our Infant and Babyland space provide safety and freedom for each baby to move, explore and discover. Physical, social, language, and cognitive development are an integral part of our infant programs and we work to meet every baby’s individual needs. 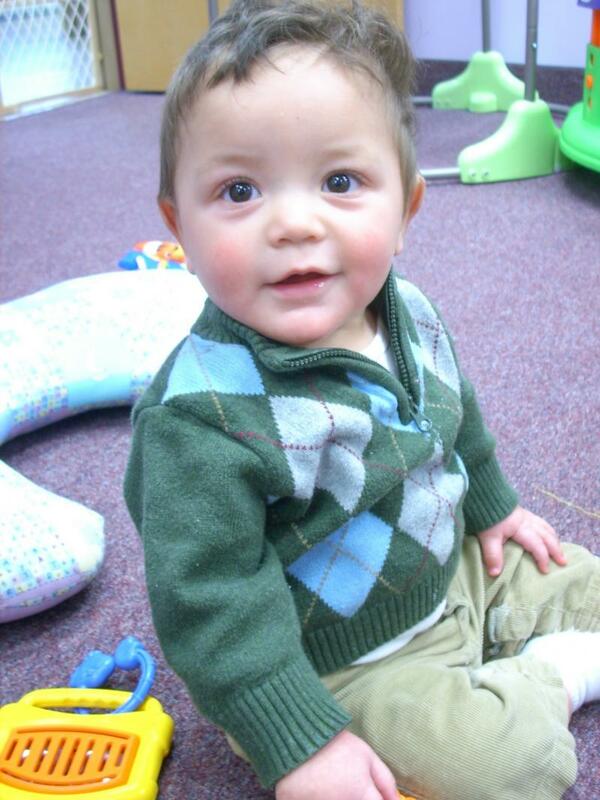 Our tiny tots program provides young toddlers with a small nurturing and stimulating environment. The emphasis of this age level is to expand language development and to promote social participation in a group setting. We work to promote self help skills to prepare the child for the toddler experience. Our daily activities intrigue young toddlers’ curiosity and challenge their developing minds and bodies. Our toddler program is based on discovery. Toddlers want to explore and manipulate everything around them. Our teachers provide the toddler minds with activities that stimulate and challenge them. Independence is promoted in the classroom. Children spend their days investigating their world in a safe environment, where they are appreciated and respected. Our goal is for children to develop a love of learning, willingness to experiment, confidence in themselves, and trust in other people. Our Preschool Program is based on language discovery, imagination and a curiosity for learning. Our curriculum is designed to foster social, emotional, physical and intellectual growth. Our teachers provide the preschoolers with theme based developmentally appropriate activities in the following area’s; math and manipulatives, science and nature, literacy, art, music and movement and gross motor skills. Children have the opportunity to play, explore, investigate and question the world around them in an environment where they are appreciated. Children are encouraged to work at a pace that is right for them. Our Pre-Kindergarten program provides challenging activities designed to promote an enthusiastic and receptive attitude toward learning. Teachers provide the children with theme based activities that promote development in the following area’s; math and manipulative, writing, science, social studies, literacy, art, music and movement, history/time concepts and gross motor skills. Emphasis is based on developing children’s awareness to their own feelings, the feelings of others, respect, trust and open mindedness. Children have the opportunity to play, explore, investigate and peer problem solve. By the end of the program, your child will be academically, socially and emotionally ready for Kindergarten and the years beyond. Children are encouraged to work at a pace that is right for them. Copyright 2010 Bee Curious Children's Learning Center. All rights reserved.